This 4BR/3.5BA house is steps from the beach with new Pool and patio area for outdoor living! This house is a great place to spend your next vacation! It has a sunny warm feel that you’re sure to appreciate. It has great deck space and outdoor seating which provides plenty of lounging space. The beach is about 100 yards away and is an easy walk for any age. When you pull up to the property you can drive straight into the spacious garage. This garage is the perfect place, not only to park out of the elements, but to unload your coolers, floats, chairs, and umbrellas. You will even see a beach wagon full of sand toys provided by the owners. The first floor is an open concept that is perfect for gathering and entertaining. The kitchen is fully equipped and has a large dining room table with seating for 10 when fully extended. The living room has two large sofas, one being a sleeper. You will also find a large 55" flat screen. 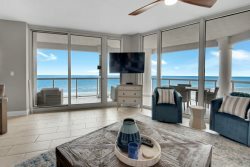 The living room patio doors can open to the huge deck and guests can enjoy views of the gulf or watch the children as they play in the pool. This is also the perfect place to sit and relax while grilling out! The first floor also has a bedroom with two queen beds, a large walk in closet, and an attached bathroom. It also has a flat screen tv mounted on the wall. A huge laundry room and a half bathroom are also located on the main level of the home. The top level of the home has a nice sized master bedroom with a king bed and a flat screen tv. Also in the master bedroom you will find a small couch that pulls out into a twin bed - perfect for the little one that still sleeps near the parents! The master bathroom is huge and has a large walk in shower, double vanity sinks, as well as a spacious walk in closet. The second bedroom on the top level is tastefully decorated and has a queen bed and a twin bed. It also has a large walk in closet and a flat screen mounted on the wall. The "bunk room" is the most popular room in the house! It was designed for not only the kids in the group but for the adults that still like to be kids. It has two built in twin bunks as well as a small sofa that pulls out into a twin bed. The best part is the electronic game table for two! Ms Pac Man, Frogger, Donkey Kong, Galaga .... you name it, this table has it! This house is located on Pensacola Beach which is known for its amazing sugar white sand. Enjoy the beach and your own private backyard pool. Reserve on our web site because this listing will book fast! Greg wad helpful and patient when we called to ask about the approaching hurricane. He answered our questions and reassured us that we would receive a text about the weather. It helped us to determine how to proceed or delay our arrival. I love that all my interactions were professional and my questions answered before I could ask them The property was exactly as advertised. I also love the communications via Text because I can refer back. Nothing was left to chance. This is a great house. We enjoyed the beach every single day because we were so close. There is plenty of room, it's well maintained and clean. The laundry room was a nice bonus as well as the garage. This property is exactly as it is represented in the description only better! Great memories made here. Ms. Claudia was very professional and helpful with every question that I had. Thank you Ms. Claudia! There was a lot of space for our extended family that came to the graduation and everyone enjoyed the breeze out on the deck each evening. There was enough space for everyone even when my sons friends showed up for his graduation bbq.